Below are some FAQ about summer camp 2019, but feel free to reach out with any additional questions. Be sure to sign up now to reserve your spot! Students aged 3 to 9 can attend camp. WHERE CAN I PRINT OUT AN OVERVIEW OF CAMP ACTIVITIES? Click here to find an overview of the activities students will participate in! Registration opens February 1st to current Selwyn students and siblings, any available spaces not enrolled by March 1st will be available to the public. WHEN IS SUMMER TUITION DUE? IS THERE FINANCIAL AID? Full tuition is required at time of enrollment. Once a student has submitted the initial summer registration with deposit, enrollment information will be sent to the family. Enrollment is on a first come first served basis. Financial Aid is not offered for Summer Camps. IS CAMP CLOSED FOR THE JULY 4TH WEEK? 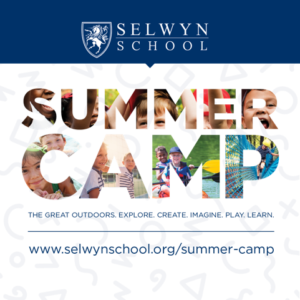 Any additions or changes to your enrollment in a camp or camps must be emailed to admissions@selwynschool.com. IS THERE AFTERCARE? WHAT ARE THE HOURS AND RATES? Snacks are included with tuition. Students need to bring their own lunch and water bottle. HOW ARE REFUNDS AND CANCELLATIONS HANDLED? The Summer Camp deposit is non-refundable. If you need to cancel your session within two weeks of your start date, there is a 50 percent cancelation fee on enrollment. Once your session starts, there will be no refunds. Camp is held on the Selwyn School Campus. During Camp, kids will enjoy a day full of fun and adventure. There will be Weekly Themes, Great Activities, Learning and Play! If you have any other questions or needs, please reach out to the Admissions office at admissions@selwynschool.com. We know that choosing the right school for your child is a very important decision. The educational environment in which a student learns significantly influences his or her development, so it is vital to make an informed decision about which school is the proper fit for your family. We thank you for your interest in applying to Selwyn and hope you will contact us with any questions you may have about this process. Selwyn School admits students of any race, color, national or ethnic origin to all the rights, privileges, programs and activities generally accorded or made available to students at the school. It does not discriminate on the basis of race, color, national or ethnic origin in administration of its educational policies, admissions policies, scholarship and loan programs, athletic or other school-administered programs. I understand that a $100 deposit is due to secure my application. I have answered all questions honestly and completely and understand that any false information is grounds for dismissal.